November 22, 2013 will be the 50th anniversary of the assassination of President John F. Kennedy. This post is part of a series that will run throughout this year focusing on songs that address the JFK assassination. “In the Summer of His Years” was written by Herbert Kretzmer and David Lee shortly after the assassination of John F. Kennedy. David Lee was a composer and conductor and Herbert Kretzmer was a lyricist for the BBC’s comedy program That Was the Week That Was (TW3). Rather than go forward with the usual satirical review of the week’s events, on the day after the assassination TW3 aired a somber tribute to John F. Kennedy, and Millicent Martin, who normally sang topical songs on TW3, sang “In the Summer of His Years” on the program. Like everything else in this tribute episode, “In the Summer of His Years” had been written within 24 hours of the assassination. Despite how quickly the broadcast had been produced, the words and music resonated with the grieving audience. 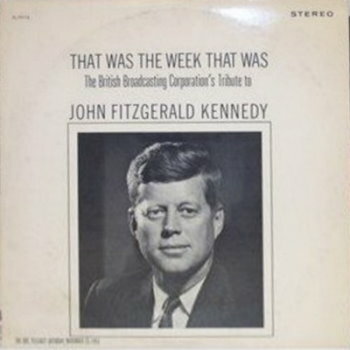 The program was rebroadcast on NBC in the United States and an LP of soundtrack of the program entitled That Was The Week That Was: The British Broadcasting Corporation’s Tribute to John FItzgerald Kennedy was released shortly afterward. Millicent Martin’s performance of “In the Summer of His Years” was included on the LP. In the days that followed, several artists recorded “In The Summer of His Years”. Mihalia Jackson recorded her version on November 29th and Connie Francis followed on December 2nd. By the time Billboard went to press for its December 14, 1963, issue, seven artists had recorded the song. The records by Millicent Martin and Connie Francis were the only versions to make the Billboard charts, although neither of them made the Top 40. Many radio stations refused to air the records because they thought it was distasteful to profit from such a tragedy. Billboard quoted a number of radio station program directors who expressed these sentiments. Billboard ran an editorial in the same issue criticizing radio stations for “crippling censorship.” While lauding radio stations’ concern about commercializing a national tragedy, the Billboard editorial argued that the records were tasteful and should be aired. The song—and the recordings of the song—are considered models of good taste by most who have heard them. A distasteful impression may be created if the songs are not properly programmed—that is, if they are surrounded by blatant commercials. The obligation to see that this does not happen falls upon the broadcaster—not upon the record company, songwriter or publisher. Connie Francis did not intend to cash in on the assassination, though, as she donated all proceeds from the sale of the single (and the album of the same name that followed) to the family of officer J.D. Tippit, who had been killed in the street when he confronted Lee Harvey Oswald following the assassination. Though charity records had been produced in the 1950s, this is one of the earliest examples of an artist donating the proceeds from sales of a record to a worthy cause. Posted on June 10, 2013 October 10, 2013 by Dead Man	in JFK Assassination. Tags: Connie Francis, JFK Assassination, Mahalia Jackson, That Was The Week That Was.